Pumpkin has many health benefits for pets, making it a food that is recommended to be safely and regularly added to a pet’s diet. 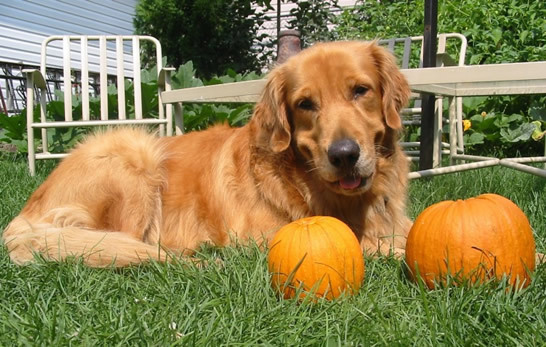 While raw pumpkin is not ideal for your dog or cat, canned and cooked fresh pumpkin, along with pumpkin seeds have many nutritional benefits. Supporting urinary health in dogs and cats: The natural oils in pumpkin within both the seeds and flesh, veterinarians believe, provide urinary tract support and help work against both kidney and bladder stones. Acting as a source of fiber to stay regular: Both diarrhea and constipation can be eliminated with the addition of pumpkin to your pet’s diet. The dietary fiber of pumpkin can both moisten obstructions as well as absorb excess water and stomach acids alleviating diarrhea and constipation woes. Mobilising and preventing furballs in cats: The fiber in pumpkins also act as a preventative agent, when consumed regularly, helping to prevent the formation of new furballs. Pumpkin may also help move furballs along your cat’s digestive tract, easing the movement and severity of furball moments. Naturally de-worming your pet: Ground pumpkin seeds contain cucurbitin, a natural amino acid, which acts as a paralyzing agent for tapeworms and other intestinal parasites. Adding to the nutritional intake: Pumpkin flesh and seeds contain high amounts of Vitamin A, Vitamin E, iron, potassium, magnesium, manganese, copper, zinc and beta-carotene. These, coupled with anti-oxidants, may help prevent cancers and other illnesses in your pet adding to their health and well-being. Help moisturise healthy skin and coats: The antioxidants and fatty acids found in pumpkin add to health of your pet’s skin and fur from the inside out by moisturising. Antioxidants, along with vitamin C, also add immune system support effects, adding electrolytes and potassium essential for muscular contraction recovery. Contributing to the weight loss of your pet: Pumpkin’s fiber allows pets to feel fuller on smaller amounts of food portions, allowing them to enjoy a tasty treat while allowing owners better weight control for their pets. Replacing one-third of your pet’s normal food servings with pumpkin will reduce their calorie-intake leaving pets feeling fuller and happier. Pumpkin should be cooked, pureed or mashed before being served to pets. Both fresh pumpkin or plain pumpkin canned can be utilized, but stay away from the spiced pumpkin pie filling. Pumpkin seeds can be served roasted whole or ground for easy consumption.